Summon: Deal 2 damage to all other creatures in this lane. Cradlecrush Giant is a rare Strength creature card. It is part of the Forgotten Hero Collection. It is available as part of the Forgotten Hero Collection. 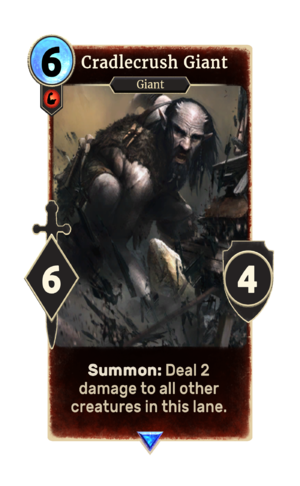 The card is named for Cradlecrush Rock, which first appeared in Skyrim. This page was last modified on 24 September 2018, at 22:33.